Oh dear, not such a nice then-and-now comparison. I really like the old school but can't say much for the present day scene. Great postcard! I love looking at old schools. I think the children are the most interesting part of the old photo. O.k., I know I'm always going on rants about how we have mowed interesting buildings for wider streets etc., but another regrettable thing we've done is to design buildings that turn their backs to the street front. It's as if we're battening down the hatches. To walk down a street against a backdrop of windowless walls is not only uninspiring, it's also very disconcerting. End of rant. The original photo is charming and beautiful. then and now always interesting but maybe not the most pleasant. It is clear that the present view is not as easy on the eye as the view from a hundred years ago. However, we must be grateful that the present view still shows an educational establishment. 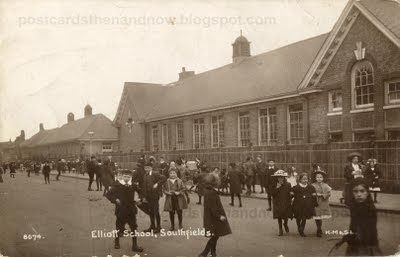 It does seem extraordinary that children were walking in the middle of the Merton Road. Today they'd be run over. Christine's point about modern buildings turning their backs on the world outside is very relevant though. It makes our modern streets very impersonal and foreboding. I'm hoping it's just a wall built to keep traffic sounds out and the lovely old building is hidden behind. This is a great postcard. I've never come across one of a school before. OMG!! my own personal nightmare!! living close to a school... and they look like they're ready to raise hell... fine pic but the kind of postcard i'd like to get saying "wish you were here!!" NOT! !